Research Logger 1.1 from Spencer Hall has been released. Research Logger is a fairly new app – it came out at the beginning of July. It’s only taken a short amount of time to see a major new release – universal support has been added, allowing Research Logger to run in the iPhone 4 and iPad’s native resolution without upscaling. So what is Research Logger? It’s an iOS app for genealogists to help keep track of their genealogy research – research that has been completed as well as research that needs to be done. It can take the place of a small notebook that many of us carry around to jot down notes and to-do lists. 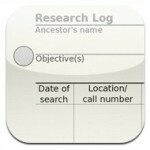 Research Logger allows you to maintain separate entries for each ancestor, along with todo lists. * Fixed bug related to deleting log entries.